I mentioned previously that I was going to dedicate a post to making Pig Stomach…so here it is! In Mexico, pancita, menudo or mole de panza are all terms for stomach, usually cow stomach, and is a dish that takes some getting used to, because it’s usually the stomach of an animal cooked or boiled, with all the funky texture you’d associate with eating “innards.” The texture, not the taste, is the challenge! Pennsylvania Dutch pig stomach, however, is baked. The stomach is stuffed with potato and sausage, some onion and, depending on the recipe, some cabbage. My mother took out an envelope marked “pig stomach knitting kit.” I asked myself how many people still have that in their kitchen. 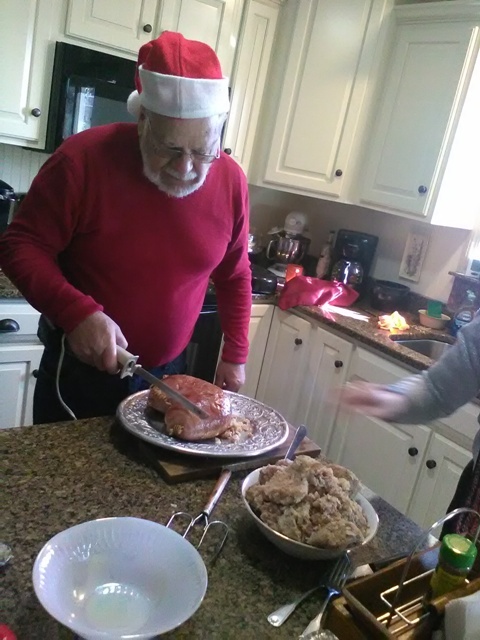 Below, my dad doing the honors this past Christmas. Oh, it was SO GOOD!